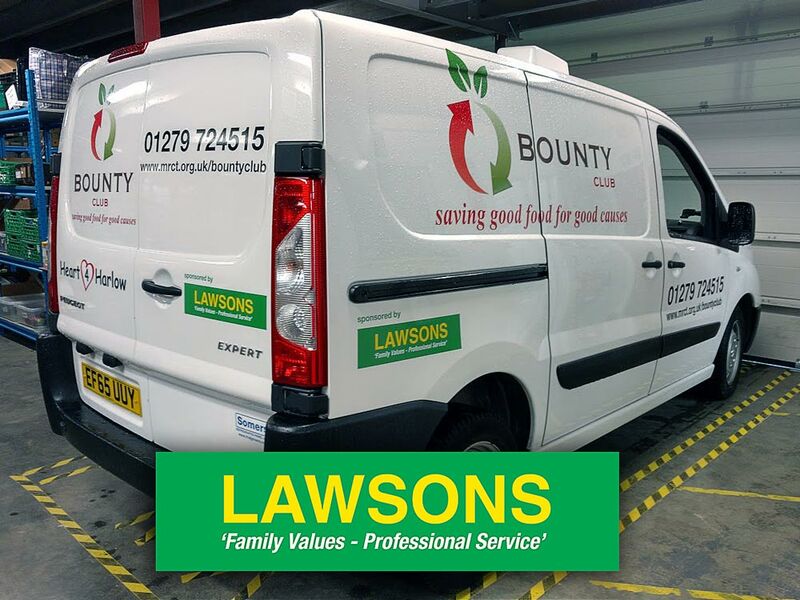 We are pleased to announce that Lawsons (Whetstone) Ltd have just agreed to sponsor our Bounty Club refrigerated van for 2017/18. Gary Knott, Director of Community Services for MRCT commented “I would like to thank Paul Sexton, Managing Director of Lawsons for helping us to obtain this valuable sponsorship which will ensure that all expenses for this vehicle are covered for the next year. This support is invaluable to us as a charity as it helps us to maintain our work with local people in need and crisis”. Lawsons have also agreed to donate and sponsor a brand new smaller van to the charity in August 2017, and we await delivery of the vehicle. “It is an absolute pleasure and a privilege for Lawsons to be working with The Michael Roberts Charitable Trust, by supporting Harlow Foodbank and the Bounty Club. Lawsons can offer support into communities and the people within going through challenging times. All the teams involved with The Michael Roberts Charitable Trust do so much, with so little for so many”. “Lawsons are proud to support such a strong community based charity”.